German dramatist; born at Munich May 22, 1802; died in Vienna March 26, 1882. He was one of the most prolific farce- and comedy-writers in Germany, and his plays have proved their worth by their long-continued popularity. Feldmann, whose early inclinations were toward poetry, was apprenticed when a boy to a saddler, but his strength proving insufficient for the work, he was indentured to a shoemaker, and soon made progress in his trade. His shoemaking career was ended abruptly by an ill-appreciated effort at poetry, addressed by him to a maiden of the vicinity, and glued to the sole of one of her shoes, which had been repaired by the future dramatist. Despairing of making a respectable cobbler of the boy, his parents sent him to school again, where, at the age of sixteen, he composed a tragedy, "Der Falsche Eid," which was produced at the Volkstheater, Munich. He next engaged in business at Pappenheim, where he remained until 1821, when he returned to Munich and abandoned commerce for literature. Soon afterward he made the acquaintance of Safir, on whose advice he gave free vent to his humorous inclinations. In 1835 he published his "Höllenlieder," a satire on a luckless love. 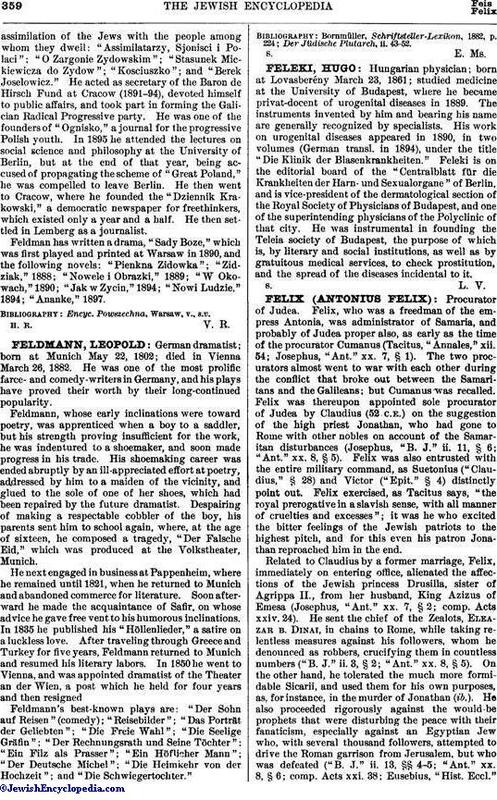 After traveling through Greece and Turkey for five years, Feldmann returned to Munich and resumed his literary labors. In 1850 he went to Vienna, and was appointed dramatist of the Theater an der Wien, a post which he held for four years and then resigned. Feldmann's best-known plays are: "Der Sohn auf Reisen" (comedy); "Reisebilder"; "Das Porträt der Geliebten"; "Die Freie Wahl"; "Die Seelige Gräfin"; "Der Rechnungsrath und Seine Töchter"; "Ein Filz als Prasser"; "Ein Höflicher Mann"; "Der Deutsche Michel"; "Die Heimkehr von der Hochzeit"; and "Die Schwiegertochter." Der Jüdische Plutarch, ii. 43-52.